The Reformers and Puritans as Spiritual Mentors: "Hope is Kindled"
Historian Michael Haykin examines the lives of such Reformers as William Tyndale, Thomas Cranmer and John Calvin to see how their display of the light of the gospel in their day provides us with a “usable past” — models of Christian conviction and living who can speak into our lives today. Born in a time of spiritual darkness, they model what reformation involves for church and culture: a deep commitment to God’s Word as the vehicle of renewal, a willingness to die for the gospel and a rock-solid commitment to the triune God. As a reminder that at the heart of the Reformation was a confessional Christianity, an essay on two Reformation confessions is also included. 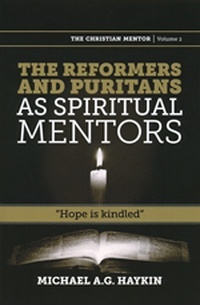 The Puritan figures who are studied are Richard Greenham, Oliver Cromwell, John Owen, Richard Baxter and his wife Margaret, and John Bunyan. In addition, a study of the translation of the King James Bible (KJB) reminds us that the Puritans, like the Reformers, were Word-saturated men and women-may we be as well.